Robert Moody begins his tenure as Music Director of the Memphis Symphony with the 2017-18 season, after one season as Principal Conductor. 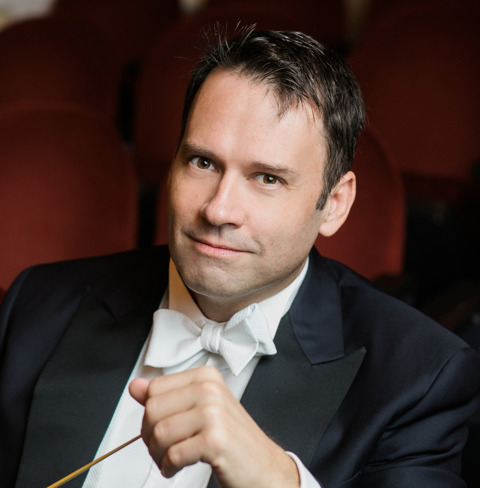 He has been Music Director of the Winston-Salem Symphony (North Carolina) since 2005, Artistic Director of Arizona Musicfest since 2007, and Music Director of the Portland Symphony Orchestra (Maine) since 2008. Moody’s 2015-16 season included debuts with the Vienna Chamber Orchestra and Columbus Symphony, as well as return engagements with the Memphis and Pacific Symphonies, and the Oklahoma City Philharmonic. Recent guest conducting appearances include the Chicago Symphony at Ravinia, and the Los Angeles Philharmonic at the Hollywood Bowl, in addition to the symphonies of Toronto, Houston, Indianapolis, Detroit, Seattle, Ft. Worth, San Antonio, Buffalo, Louisville, and, in Europe, the Slovenian Philharmonic. Summer festival appearances include Santa Fe Opera, Spoleto Festival USA, Brevard Music Center, Sewanee Festival, Eastern Music Festival, PortOpera, and the Oregon Bach Festival. Equally at home in the opera pit, Moody began his career as apprentice conductor for the Landestheater Opera in Linz, Austria. He has gone on to conduct at the opera companies of Santa Fe, Rochester, Hilton Head Opera, and North Carolina Opera. He also assisted on a production of Verdi Otello at the Metropolitan Opera, conducted by Valery Gergiev, and at The English National Opera, where he was Assistant Conductor for Kurt Weill Street Scene. He made his Washington National Opera and North Carolina Opera debuts in 2014, and he conducts Bartok Bluebeard’s Castle, Leoncavallo I Pagliacci, and Poulenc Dialogues of the Carmelites during 2016-2017. Moody served as Associate, then Resident Conductor, of The Phoenix Symphony (AZ) from 1998 through 2006. There he conducted a wide variety of concerts, including Classics, Chamber, Pops, Family, Handel’s Messiah, and the New Year’s Eve gala. His ability to speak with ease from the podium helped new converts to classical music and enthusiasts alike to gain a greater appreciation for orchestral music. Audiences at his concerts grew considerably during his time in Phoenix. Moody also founded The Phoenix Symphony Chorus, and for seven years was Music Director of the Phoenix Symphony Youth Orchestra. Prior to Phoenix, Moody served as Associate Conductor for the Evansville (IN) Philharmonic Orchestra, and Music Director (and founder) of the Evansville Philharmonic Youth Orchestra. Moody conducted the first professional performance of a work by the brilliant young composer Mason Bates, now Composer-in-Residence with the Kennedy Center for the Performing Arts, and was instrumental in the commissioning and premiere performances of several of Bates’ important major works for orchestra. Moody’s work can be heard on several commercially released compact disc recordings. He collaborated with the Canadian Brass for their Bach and Legends CDs; he is also the conductor for the CD Fourth World, highlighting the music of Native American recording artist R. Carlos Nakai (available on the Canyon Record label); and in 2010, the Winston-Salem Symphony released their performance (live from 2009) of Beethoven’s Symphony No. 9. A DVD of Beethoven Symphony No. 9 with Arizona Musicfest was released in 2012. Recently, he was honored to conduct on the “Cancer Blows” concert with Ryan Anthony, members of the Dallas Symphony, and a host of trumpet luminaries, to aid the fight against Multiple Myloma. CD and DVD recordings of that live concert, held in Dallas, TX in March 2015, are now available for purchase.